Summary The prognosis for patients with cystic fibrosis (CF) has improved greatly over the past 30 years but the median age of survival is still only to the patients late 30s. New treatments are required to decrease morbidity and improve mortality. The basic defect in CF lies in the cystic fibrosis transmembrane conductance regulator (CFTR) gene, mutations of which lead to a dysfunctional CFTR protein. The way in which the protein is defective differs between the six so-called mutation classes. An understanding of these classes has led to the development of mutation-specific small-molecule treatments. Class I mutations are caused by the presence of a premature termination codon. Ataluren is a systemic agent that allows read-through of the mutated mRNA and translation of full-length protein. A phase III clinical trial has recently been completed. In class II mutations, the most common of which is Phe508del (previously termed ΔF508), the resulting CFTR protein is misfolded and is not trafficked through the cytoplasm to the cell membrane. CFTR-corrector drugs seek to facilitate such trafficking; recently increased understanding of the complex nature of the misfolding events may explain why this approach is, to date, rather difficult. Improvements in CFTR protein function have been achieved in vivo and clinical trial data are beginning to emerge. It may be necessary to use correctors with potentiators and combination trials of two correctors, VX-809 and VX-661, with or without the CFTR potentiator ivacaftor are underway. The latter was initially developed and tested in patients with the class III mutation Gly551Asp (previously termed G551D). In cells with this mutation, CFTR protein reaches the cell surface but fails to respond to cellular signals to open and conduct chloride. Ivacaftor increases the probability that the channel is open and has led to significant clinical benefit in patients with the Gly551Asp mutation; it is now being investigated in other class III and some class IV mutations. Ivacaftor is the first genotype-specific treatment to demonstrate clinical efficacy and to be approved for licence. Other compounds are currently in development and the field is optimistic that drugs for other genotypes will not be far behind. This year, a new drug, ivacaftor (trade name Kalydeco®; Vertex Pharmaceuticals Inc., Cambridge, MA, USA), has received approval for use by regulatory bodies in both the USA and Europe. The drug is the first mutation-specific treatment to gain marketing approval and marks the beginning of a new era of personalised treatment for cystic fibrosis (CF). This article reviews the basic science underpinning this disease and the exciting progress in the development of new small-molecule treatments. CF occurs in the presence of two CF disease-causing mutations. Inherited in an autosomal recessive fashion, CF has a prevalence of approximately 1:2,500 and a carrier rate of around 1:25 in the Caucasian population. It is estimated that there are approximately 60,000–70,000 people with CF worldwide . It is a multisystem disease, primarily affecting the lungs but also with significant pancreatic, liver and gastrointestinal involvement, and infertility in the majority of males. Most individuals with CF are pancreatic insufficient from birth, meaning that enough damage has already been done to the pancreas to cause failure of secretion of pancreatic enzymes to the gastrointestinal tract and, therefore, an inability to absorb fat. This leads to steatorrhoea and failure to gain weight. Pancreatic enzymes are required with each meal or snack in order to allow fat absorption and adequate growth. Pancreatic endocrine function can also be affected and CF-related diabetes occurs in approximately one-third of CF patients, commonly later in life at a median of 20 years. Manifestations of gastrointestinal tract involvement include meconium ileus in neonates and, later, distal intestinal obstruction syndrome. Involvement of the liver occurs to some degree in almost all patients, but severe liver disease is seen in about 5% of people with CF. An alteration in bile acid composition due to abnormal cystic fibrosis transmembrane conductance regulator (CFTR) is thought to be responsible for this, although the exact pathophysiology is not fully understood. The male reproductive tract is also affected, with 98% of male patients having bilateral absence of the vas deferens and resultant obstructive azoospermia . Lung involvement occurs from an early age with intermittent then chronic bacterial infection, inflammation, and eventual bronchiectasis, fibrosis and death from respiratory failure. People affected by CF are particularly susceptible to certain bacteria, including Staphylococcus aureus, Pseudomonas aeruginosa and Burkholderia cepacia, although more recently, the use of molecular detection techniques has revealed much more diverse bacterial populations present in the lower airway than hitherto suspected. CF has been described in the medical literature as long ago as 1606 with the description of “a child who tastes salty being bewitched and will soon die”. It was more formally described in the 1940s . In 1985, the gene that caused this disease was localised to the long arm of chromosome 7, position 7q21–24 , with the sequence being fully identified in 1989 . In its normal, wild-type form, the CFTR gene encodes a 1,480 amino acid protein  that sits within the cell surface and acts as a cyclic AMP-regulated ion channel. CFTR is a direct conductor of chloride and bicarbonate ions, and interacts closely with the major sodium-absorbing channel, ENaC (epithelial sodium channel), inhibiting its activity. Defects in CFTR lead to reduced chloride secretion and hyperabsorption of sodium and, thus, water; the combined effect of which is dehydration of the cell surface. Mucociliary clearance is impaired and the infective/inflammatory sequelae of this ensue. It is not known whether the decreased volume of airway surface liquid alone causes the predisposition to infection, the immune system is also affected causing a defect in pathogen killing or other environmental factors within the CF airway prevent the innate immune system functioning as efficiently as in individuals without CF. Over 1,800 mutations within the CFTR gene have been described but not all of these cause disease. Some mutations still produce a functional protein and are probably more accurately termed as benign polymorphisms. The CFTR2 database is a worldwide database seeking to collate all available data on these mutations and determine their role in CF pathogenesis . Those that lead to disease can be divided in to six classes according to the way in which the resulting protein is defective, described in table 1. Class I mutations lead to a premature stop codon in the mRNA and, therefore, a short, non-functioning protein is translated. Those of class II encode a structurally abnormal, misfolded protein that is removed by the endoplasmic reticulum before reaching the cell surface. Protein of classes III to VI reach the cell surface but fail to function appropriately: class III mutations have decreased activation of the channel and remain closed, and class IV mutations cause decreased conductance of ions across the channel. Class V mutations encode proteins with splice site mutations resulting in a reduced amount of CFTR at the cell surface, so some function occurs but at a reduced level. Class VI mutations lead to a shortened half-life due to protein instability and may also impair CFTR’s regulation of neighbouring channels. A pictorial representation of the six classes can be seen in figure 1. Differing protein defects that occur in each CFTR mutation class. NBD: nucleotide binding domain; RD: regulatory domain. Until very recently, all respiratory treatments were aimed at tackling the downstream consequences that occurred as a result of malfunctioning CFTR. Such treatments include: prevention/suppression of infection by use of long-term oral or nebulised antibiotics; prompt and aggressive treatment of exacerbations with oral or intravenous antibiotics; and exercise, physiotherapy and nebulised mucolytics to aid airway secretion clearance. The use of these treatments along with more aggressive management and a greater focus on optimal nutrition has led to a significantly improved outcome with longer life expectancy. Median life expectancy is currently 37 years and most children born with CF today are expected to survive to their fifth decade. However, CF continues to carry a significant morbidity and treatment burden, despite which, life expectancy still falls far short from that of individuals without CF. It is for this reason that new treatments are sought. At present, two very different approaches target the basic defect: gene therapy and mutation-specific small-molecule drug therapy. The first, if proven successful, would be of benefit regardless of the underlying genetic defect and is not discussed further in this article. An update of this field can be read in the review by Griesenbach and Alton . Advances in the technology of high-throughput screening have allowed up to 100,000 small molecules to be tested simultaneously, in an attempt to identify those with the potential to improve the function of the defective CFTR protein [10, 11]. The two main groups of drugs have been termed “correctors” and “potentiators”. CFTR correctors are designed to correct trafficking of misfolded CFTR protein to the cell membrane, where it can function, albeit not at wild-type levels. CFTR potentiators target CFTR that is already at the cell surface (either naturally, as in the class III–VI mutations, or as the result of successful correction), improving its function. Once small molecules with potential corrector or potentiator function have been identified in such high-throughput or preclinical screens, translation into clinical practice takes many years. To date, one molecule has been approved for patient use but others are in clinical trials. Class I, or nonsense, mutations account for approximately 5–10% of the worldwide CF population, although the incidence is increased to around 60% amongst Israeli CF subjects [12, 13]. The most common are Gly542X (previously G542X) and Trp1282X (previously W1282X) . As described above, class I mutations are due to a premature termination codon (PTC), which terminates CFTR protein translation too early. The truncated protein is non-functioning and does not reach the cell surface. Several years ago, it was discovered that gentamicin possessed the ability to mask these PTCs by inserting a random amino acid that allowed the ribosome to read through and led to the production of full-length protein. Up to 35% wild-type CFTR function was achieved during in vitro studies [14, 15] and the approach was successful in generating full length CFTR in a Gly542X mouse model . Early-phase clinical trials provided promising initial results. An open-label pilot study using gentamicin nasal drops found participants to have improved measurements of nasal potential difference (nPD), a sensitive read-out of CFTR-mediated ion transport . This result was echoed in several further studies, including a double-blind, placebo-controlled crossover trial of 26 patients . This trial reported an improvement in patients with class I mutations but no change in patients with Phe508del. These initial studies were conducted in Israel but results were similar in two further studies, one in the USA and one in France, which studied intravenous administration of gentamicin [18, 19]. Again, nPD measurements improved, but this was not universal and while some patients had a dramatic improvement, others had no change. The difference may be due to variation in protein translation that occurs with different mutations within this class. These trials provided important proof-of-concept data but the toxicity profile of aminoglycosides is unfavourable, so synthetic alternatives were sought. One such agent, ataluren (PTC124; PTC Therapeutics, South Plainfield, NJ, USA) has progressed through to recent completion of a multicentre phase III trial . This uses a different mechanism of action to the aminoglycosides, but also allows ribosomal read-through of the PTC while not interfering with the correct stop codon. Initial laboratory based studies with CF mice demonstrated proof of concept with this agent and this was supported by data from some phase II studies  but other studies differed in their outcomes. A study in Israel involving 23 patients showed improved nPD measurements in most subjects  as did a trial conducted in children in France and Belgium . However, no significant difference was observed in a similar trial conducted in a US cohort . A phase III study looked at the effect of ataluren on CF patients, aged 6 years and above, with at least one class I mutation. 238 subjects were recruited to this trial, of whom just under a third were less than 18 years of age. The trial has now been completed and, although at the time of writing the data have not been published, results have been presented at two international conferences [21, 25]. Unfortunately, the primary outcome, change in forced expiratory volume in 1 s (FEV1), was not significantly different between the two groups, nor were the secondary outcomes. A predefined subgroup analysis did show that the group of patients not receiving inhaled aminoglycosides had a significant treatment-related benefit; it was hypothesised that the presence of these drugs interferes with the action of ataluren and is investigating this further. Importantly, CF is not the only disease to be caused by PTCs; many inherited diseases, such as sickle cell anaemic and Duchenne’s muscular dystrophy (DMD), also have this cause. Drugs that are able to read through PTCs are likely to be beneficial in multiple diseases and, although clinical trials of ataluren in DMD have been somewhat disappointing to date [26, 27], this type of genetic mutation is an attractive therapeutic target. Class II defects are present in the majority of patients with CF worldwide. Phe508del (previously ΔF508) is carried by approximately 90% of the CF population, 50% being homozygous and 40% heterozygous . 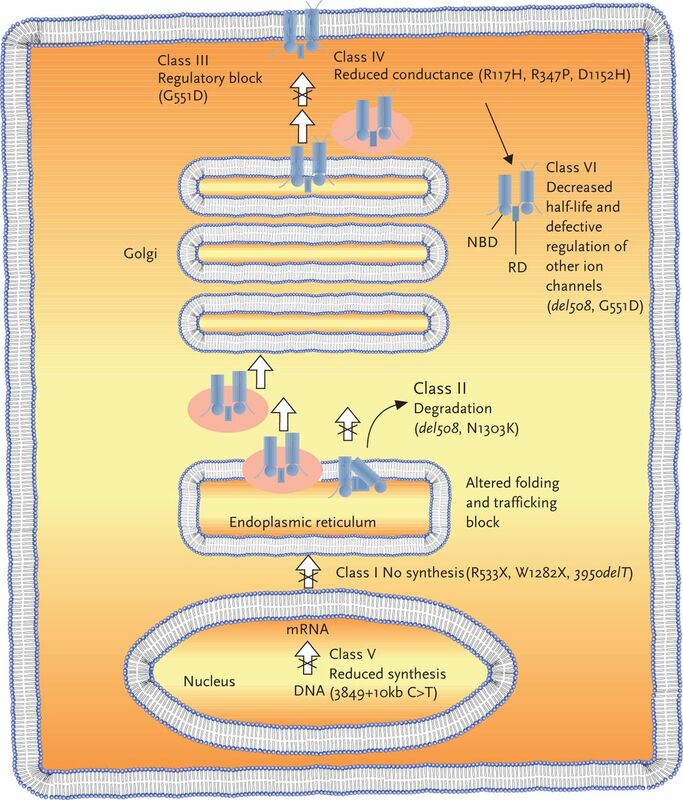 As described above, the vast majority of class II CFTR is degraded by intracellular processes and fails to reach the cell surface. The absolute amount that escapes this degradation differs between individuals and may account, in part, for the phenotypic variation observed. The concept of CFTR correctors has been around for many years, although the term has only recently been coined. In the 1980s, an observation was made that low temperatures and glycerol stabilised misfolded CFTR protein and facilitated trafficking; the term “molecular chaperone” was coined for a drug with these capabilities [29, 30]. Glycerol is highly toxic and could not progress into clinical trials . However, clinical trials were performed on a second compound, sodium-4-phenylbutyrate, which led to small improvements in nPD and was safe and well tolerated [31, 32]. High-throughput screening was conducted by several commercial and academically funded groups and one of these, Vertex Pharmaceuticals Inc., identified a promising small molecule named VX-809. In vitro chloride transport could be achieved at 14% of wild-type CF levels . The results from the first phase II trial in 89 patients were somewhat disappointing. As the drug is given systemically, sweat chloride is a convenient biomarker and had shown utility in trials of potentiator agents; in this trial, there was a statistically significant reduction in sweat chloride, confirming proof of concept, but the magnitude was small at around 7 mmol·L−1. In addition, no change was seen in nPD or clinical parameters within the 4-week treatment period . As well as a trafficking defect, Phe508del CFTR protein is abnormally gated. It was therefore hypothesised that VX-809 could improve the localisation of CFTR protein to the cell surface but once there, it needed additional help to function; this led to the notion of combination trials. VX-770 (ivacaftor), which had been shown to have dramatic improvement in the movement of ions across the cell membrane in class III mutations (discussed in detail below), was considered unlikely to benefit patients homozygous for Phe508del, and this was borne out in a phase II study of 140 patients . However, in vitro, combining VX-809 with ivacaftor doubled the chloride transport compared with that of VX-809 alone. A clinical trial in Phe508del homozygotes reported a decrease of 13 mmol·L−1 in sweat chloride at day 21 of combined treatment  and further work is underway to evaluate the effect of this combination. Interim results presented at the North American CF Conference 2012 demonstrated an improvement in FEV1 at the highest administered dose of VX-809. Vertex Pharmaceuticals Inc. is also developing an alternative corrector, VX-661. It possesses a possible advantage over VX-809 in that its metabolic pathway does not interact with that of ivacaftor and achieving therapeutic levels may be easier. Phase II clinical trials of this agent alone and in combination with ivacaftor in CF patients homozygous for Phe508del are currently recruiting (www.clinicaltrials.gov identifier NCT01531673). Such small molecules, if found to be effective, may work on a wider range of mutations than just Phe508del or they may be very specific to each mutation, with a new corrector being required for each mutation. A corrector developed with the aim of improving the function of Phe508del, Corr4, was found to have minimal or no effect on such CF cells. However, it did have a dramatic effect on the rarer class II mutation, Val23Asp, improving the misfolding and allowing trafficking to the cell surface to reach almost wild-type levels . If molecules are confirmed to be effective for Phe508del, further studies will be required to assess their effectiveness in other class II mutations. Ivacaftor is a CFTR potentiator and is the first mutation-specific drug to be approved in both the USA and Europe. This approval marks the beginning of a new era in the treatment of CF. Class III mutations lead to a protein that remains closed for almost 100% of the time, a so-called gating defect. The most common class III mutation is Gly551Asp (previously named G551D), which is carried by approximately 4% of CF patients. Other class III mutations are all rare and, together, probably only account for a further 1% of patients. Ivacaftor was one of the molecules identified via high-throughput screening technology, with the capability to act as a CFTR potentiator by modulating the function of the abnormal protein channel [38–40]. In vitro studies demonstrated an increase in chloride movement at the cell membrane after treatment with ivacaftor  and so clinical trials of a bioavailable oral formation were undertaken. The initial phase II study involved 39 participants and impressive results were seen: CFTR function, as measured by sweat chloride concentration, improved within 3 days of commencing the drug, falling by almost 60 mmol·L−1 into the borderline or even non-CF range; this change persisted at 28 days . There was also an improvement, although of a smaller magnitude, in nPD measurements. Since then, there have been two large phase III trials, STRIVE (subjects aged 12 years or older) and ENVISION (aged 6–11 years), both recruiting CF patients with at least one Gly551Asp allele. Both were placebo-controlled, randomised trials lasting 48 weeks. After the 48-week period, participants were invited to take part in PERSIST, an open-label rollover trial. 161 subjects were randomised in STRIVE . The primary outcome was change in FEV1, in which there was a highly significant treatment effect of 10.6 absolute percentage points (equivalent to a relative improvement of 17.2% from baseline). Changes were seen by day 15 and persisted to week 48. There was a significant improvement in quality of life and a reduction in the number of acute exacerbations. A perhaps unexpected finding was a significant gain in weight of 2.7 kg in the treatment group. Given the fact that the mean age was 25.5 years, weight gain was not anticipated. Whether this improvement in weight was due to overall improved health or an effect of improved CFTR function within the gastrointestinal tract aiding nutritional status remains to be seen. In line with the phase II results, there was also a significant drop in sweat chloride concentration. ENVISION  had a very similar study design and recruited 52 children at a mean age of 8.9 years. Similar results were seen as those in the adult study, with the exception of the quality-of-life scores, which showed a nonsignificant trend towards improvement, perhaps related to a ceiling effect in this relatively well population. Encouragingly, the magnitude of the FEV1 effect was very similar, despite higher baseline values, confirming the potential for benefit with this drug at earlier stages of disease. Ivacaftor was well tolerated in both trials. Adverse events encountered more frequently in the treatment group than the placebo group included sore throat, upper respiratory tract infection, nasal congestion, rash and dizziness. Only one patient in the treatment arm had to discontinue the drug due to adverse events and this was due to elevated liver enzymes. However, four patients in the placebo group withdrew due to adverse events, of which one was also due to elevated liver enzyme levels . Thus, ivacaftor has been found to be effective on multiple outcome measures in patients from ages 6 years and older, the group for which approval has now been granted. However, safety and efficacy studies for children younger than this have not yet been performed. We know that if we look with sensitive enough tools, lung disease begins in the infant and preschool years; lung clearance index , computed tomography parameters  and bronchoalveolar lavage  can all be abnormal long before conventional spirometry deteriorates. Correcting the primary defect in the CF airway before any lung damage has occurred must, in our opinion, be better than trying to impact existing lung damage, much of which we know is irreversible. A clinical trial looking at ivacaftor in children as young as 2 years old was announced at the North American CF Conference in October 2012 . Following the remarkable success of ivacaftor in patients with Gly551Asp mutations, the possibility of its use in other class III mutations is being explored. Nine other gating mutations were evaluated in vitro and demonstrated a similar response to that seen in that seen in Gly551Asp . It seems a reasonable assumption that this effect will translate to similar clinical findings and a trial to address this has started. CF patients aged 6 years and upwards with any gating mutation (excluding Gly551Asp) are being enrolled into a phase III double blind randomised, placebo-controlled trial. Recruitment is underway and the trial is expected to be completed in early 2014 (NCT01614470). Class IV mutations are missense mutations, the most common of which is Arg117His (previously R117H) affecting 3% of the CF population of the USA . This mutation causes a variable phenotype and, in some patients, leads to a less severe disease. Little has been done to date on specific treatments for this class of mutations. While no treatments are currently being sought purely for this mutation class, CFTR potentiators may be of benefit. A clinical trial to assess the effect of ivacaftor on CF patients with Arg117His is currently recruiting (NCT01614457). It is an exciting time for those patients with Gly551Asp (and probably soon will be for those with other class III mutations). Ivacaftor has been granted approval in the USA and Europe but the issue of funding remains a challenge in some countries. Ivacaftor is now being prescribed in some countries including the USA, France and Germany. In other countries, such as the UK, a decision with regards to national funding of the drug has yet to be made. Once patients with Gly551Asp begin taking this medication on a more widescale level, there are questions to be answered about long-term use. These questions will start to be addressed by the GOAL study , which looks at longer term use of the drug. It is clear that significant benefits exist and these persist at 1 year but will these benefits persist at 3, 5, 10 and 20 years? Will side-effects emerge from longer term treatment? So far, patients have been encouraged to continue with usual medications, but will it enable patients to reduce treatment burden and, importantly, will it prevent lung disease if started at an early age? These questions will be addressed over the future years in trials and post-market studies. Another issue, certainly true for the UK, is that not all patients have been completely genotyped. Until now, a positive sweat test in the context of a characteristic phenotype would have been sufficient for most clinicians to make a confident diagnosis; genotyping may not have been pursued beyond the basic. It is our opinion that full mutation analysis should now be performed on all patients with one or two unknown mutations; although this is costly and may, therefore, be challenging. Without this information, any potential benefit from these new agents will be missed. Among the excitement surrounding ivacaftor remains the fact that it will not help the majority of the CF population. However, the huge clinical success of this agent has clearly catalysed research in this area, with many different pharmaceutical companies now researching and developing corrector compounds. Although this is likely to be a much harder nut to crack, it has, to quote C.H. Spurgeon , “a very sweet kernel” in terms of the proportion of patients likely to benefit. There have been over 1,800 genetic mutations identified in the CFTR, which can be divided into six groups based on their effects on protein production or function. In the most common type of CFTR mutation, Phe508del, misfolded CFTR fails to reach the cell surface; drugs that can “correct” this are being explored in clinical trials . In many other groups, CFTR on the cell surface fails to function properly but can be “potentiated” by small-molecule approaches . One drug, which allows function of the gating (class III) mutation Gly551Asp (G551D), has recently been approved. Clinical trials are underway to evaluate this dug in other mutations and in combination with corrector agents. For which CF mutation in which class has a small­molecule therapy been licensed for clinical use? What is the under lying protein defect in this class of mutations? Premature stop codon causing truncated protein. What is the defect observed in the more commonly encountered mutation Phe508del (a class II defect)? The protein is misfolded; therefore, it is not trafficked correctly through the cell to the cell membrane. A premature stop codon produces a short and nonfunctional protein. The protein is misfolded; it reaches the cell surface but, once there, cannot function correctly. Splicing of the protein occurs leading to reduced amounts of protein at the cell surface and, therefore, decreased ion transport. Patients are becoming increasingly aware of this personalised medicine approach and the importance of knowing and understanding their own mutations. Mr X has the mutations Phe508del and W1282X. He wants to know if he is likely to benefit from any of the new drugs he has read about, either now or in the future. What would you tell him? There are no current clinical trials relevant to his mutations. A small molecule therapy VX809 is being developed; if successful, he may benefit from this drug, although this is probably some way off. He will benefit from the new drug ivacaftor and can start taking it as soon as soon as funding is in place. Clinical trials for nonsense mutations have been conducted. While primary end­points were not met, further studies are planned. He may benefit from such drugs if they are found to be successful. J.C. Davies has served on advisory boards and as principal investigator in trials sponsored by pharmaceutical companies.
. Cystic Fibrosis. www.utoronto.ca/kids/cystic.htm Date last accessed: November 28, 2011. Date last updated: 2009.
. Cystic fibrosis. In: Wilmott R W, Boat T F, Bush A, et al., eds. Kendig and Chernick’s Disorders of the Respiratory Tract in Children. 8th Edn. Philadelphia: Elsevier, 2012; pp. 753–795.
. Physiological basis of cystic fibrosis: a historical perspective. Physiol Rev 1999; 79: Suppl 1, S3–S22.
. Cystic fibrosis of the pancreas. Arch Dis Child 1942; 17: 220–226.
. Localization of cystic fibrosis locus to human chromosome 7cen-q22. Nature 1985; 318: 384–385.
. Identification of the cystic fibrosis gene: cloning and characterization of complementary DNA. Science 1989; 245: 1066–1073. CFTR2wwwcftr2.com Date last accessed: September 14, 2012. Date last updated: 2012.
. Current status and future directions of gene and cell therapy for cystic fibrosis. BioDrugs 2011; 25: 77–88.
. Correctors of protein trafficking defects identified by a novel high-throughput screening assay. Chembiochem 2007; 8: 1012–1020.
. Chronic ataluren (PTC124) treatment of nonsense mutation cystic fibrosis. Eur Respir J 2011; 38: 59–69.
. New drugs for cystic fibrosis. Expert Opin Investig Drugs 2011; 20: 1285–1292.
. Aminoglycoside antibiotics restore CFTR function by overcoming premature stop mutations. Nat Med 1996; 2: 467–469.
. Suppression of a CFTR premature stop mutation in a bronchial epithelial cell line. Nat Med 1997; 3: 1280–1284.
. A pilot study of the effect of gentamicin on nasal potential difference measurements in cystic fibrosis patients carrying stop mutations. Am J Respir Crit Care Med 2000; 161: 860–865.
. Gentamicin-induced correction of CFTR function in patients with cystic fibrosis and CFTR stop mutations. N Engl J Med 2003; 349: 1433–1341.
. Evidence that systemic gentamicin suppresses premature stop mutations in patients with cystic fibrosis. Am J Respir Crit Care Med 2001; 163: 1683–1692.
. In vitro prediction of stop-codon suppression by intravenous gentamicin in patients with cystic fibrosis: a pilot study. BMC Med 2007; 5: 5.
. PTC124 targets genetic disorders caused by nonsense mutations. Nature 2007; 447: 87–91.
. Pretreatment data from phase 3 study of ataluren document significnat disease burde in a subpopulation of patients with nonsense mutation cystic fibrosis. Pediatr Pulmonol 2011; 46: Suppl. 34, 295.
. Effectiveness of PTC124 treatment of cystic fibrosis caused by nonsense mutations: a prospective phase II trial. Lancet 2008; 372: 719–727.
. Ataluren (PTC124) induces cystic fibrosis transmembrane conductance regulator protein expression and activity in children with nonsense mutation cystic fibrosis. Am J Respir Crit Care Med 2010; 182: 1262–1272.
. No detectable improvements in cystic fibrosis transmembrane conductance regulator by nasal aminoglycosides in patients with cystic fibrosis with stop mutations. Am J Respir Cell Mol Biol 2007; 37: 57–66.
. Results of the phase 3 study of Ataluren in nonsense mutation cystic fibrosis. Pediatr Pulmonol 2012; 47: Suppl. 35, 290.
. Results of a Phase 2b, dose-ranging study of ataluren (PTC124) in nonsense mutation Duchenne/Becker muscular dystrophy (nmDBMD). Neuromuscular Disord 2010; 20: 656–657.
. Read-through strategies for suppression of nonsense mutations in Duchenne/ Becker muscular dystrophy: aminoglycosides and ataluren (PTC124). J Child Neurol 2010; 25: 1158–1164.
. Combination of correctors and potentiators for F508Del CFTR. Pediatr Pulmonol 2011; 46: Suppl. 34, 180.
. Chemical chaperones correct the mutant phenotype of the delta F508 cystic fibrosis transmembrane conductance regulator protein. Cell Stress Chaperones 1996; 1: 117–125.
. Glycerol reverses the misfolding phenotype of the most common cystic fibrosis mutation. J Biol Chem 1996; 271: 635–638.
. Emerging drug treatments for cystic fibrosis. Expert Opin Emerg Drugs 2003; 8: 523–535.
. Novel, mechanism-based therapies for cystic fibrosis. Curr Opin Pediatr 2005; 17: 385–392.
. Ivacaftor in subjects with cystic fibrosis who are homozygous for the F508del-CFTR mutation. Chest 2012; 142: 718–724.
. VX-809, An investigational CFTR corrector, in combination with VX-770, an investigational CFTR potentiator, in subjects with CF and homozygous for the F508DEL-CFTR mutation. Pediatr Pulmonol 2011; 46: Suppl. 34, 287.
. Increased folding and channel activity of a rare cystic fibrosis mutant with CFTR modulators. Am J Physiol Lung Cell Mol Physiol 2011; 301: L346–L352.
. Direct interaction of a small-molecule modulator with G551D-CFTR, a cystic fibrosis-causing mutation associated with severe disease. Biochem J 2009; 418: 185–190.
. Effect of VX-770 in persons with cystic fibrosis and the G551D-CFTR mutation. N Engl J Med 2010; 363: 1991–2003.
. VX-770 in subjects 6 to 11 years with cystic fibrosis and the G551D-CFTR mutation. Pediatr Pulmonol 2011; 46: Suppl. 34, 283.
. Evaluation and use of childhood lung function tests in cystic fibrosis. Curr Opin Pulm Med 2012/Nov; 18: 602–608. Cystic Fibrosis Foundation. Kalydeco™. www.cff.org/treatments/Therapies/Kalydeco Date last accessed: August 24, 2012. Date last updated: August 2012.
. CFTR Modulation – 25 Years of NACFC Progress. NACFC Plenary Archives. www.nacfconference.org/plenaryarchive.asp Date last accessed: January 20, 2012. Date last updated: 2011.
. On patience. In: Altemus H. , ed. John Ploughman′s Talks. Princeton, Princeton University Press. 1896.